A long-lost portrait of a Nigerian princess dubbed the "African Mona Lisa" sold at auction in London on Wednesday for £1.2 million (1.4 million euros, $1.7 million), exceeding estimates and setting a record for the artist. The 1974 painting of Adetutu "Tutu" Ademiluyi, by Nigerian artist Ben Enwonwu, was expected to fetch up to £300,000 (339,000 euros, $414,000) when it went under the hammer at Bonhams auction house. It described the painting of an Ife royal princess which recently turned up in a London flat after not being seen in decades as "rare and remarkable". "The portrait of Tutu is a national icon in Nigeria, and of huge cultural significance," said Giles Peppiatt, Bonham's director of modern african art. He uncovered the work after a family in north London contacted him following lucrative recent sales of Nigerian artworks at auction. Peppiatt added the family were "pretty astounded" to learn it was "a missing masterpiece". "It is very exciting to have played a part in the discovery and sale of this remarkable work," he said. 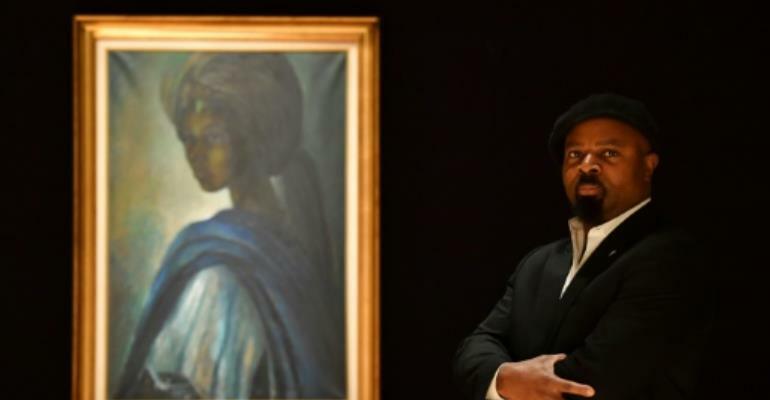 Booker Prize-winning novelist Ben Okri told AFP earlier this month that the painting had taken on almost mythical status in his native Nigeria where it was thought of as "the African Mona Lisa". "It has been a legendary painting for 40 years, everybody keeps talking about Tutu, saying 'where is Tutu?'" he said after a viewing at Bonhams. "He wasn't just painting the girl, he was painting the whole tradition. It's a symbol of hope and regeneration to Nigeria, it's a symbol of the phoenix rising," Okri added. The painter Enwonwu, who died in 1994, is considered the father of Nigerian modernism. He made three paintings of "Tutu", the locations of all of which had been a mystery until the recent discovery. The works became symbols of peace following the clash of ethnic groups in the Nigerian-Biafran conflict of the late 1960s. Enwonwu's work "Negritude", also painted in the 1970s, sold for £100,000 (113,000 euros $138,000)in the same sale. The auction was broadcast live to a Bonhams site in Lagos, where bidders were able to participate in real time.